The Department of Homeland Security (DHS) is asking Congress for more powers to combat against malicious drones that could threaten the US. Top intelligence officials are increasingly concerned about the use of transporting narcotics via drones by drug cartels and weaponized drones by terrorists. CBS News correspondent Jeff Pegues was granted rare access and observed government surveillance drones in action at a Customs and Border Protection (CBP) facility in Tucson, Arizona. Pegues saw behind the scenes of what it takes to operate a drone unit that frequently surveils the Mexico–US border searching for illegal activity. He met with DHS' top intelligence official David Glawe and CBP Chief Rodolfo Karisch to discuss the threat of drones. "If you want to move people, narcotics, God forbid weapons of mass destruction or anything else over the border, you have a surveillance location that can be now automated with drones at a very inexpensive cost by organizations outside of the United States," Glawe said. Countless videos over the last several years have shown ISIS using commercial grade drones for precision bombing strikes on their enemies. Last month, two drones packed with high explosives reportedly flew toward Venezuelan President Nicolas Maduro in what the Venezuelan government has described as a failed assassination attempt. "Any time drones are used for an attack, what appears to have been an assassination attempt, it's gravely concerning," Glawe said. Glawe then took CBS News to a secret command facility that monitors drones approaching the border. He said weaponized drones programmed to attack sporting events and or even the White House are the government's largest concerns. 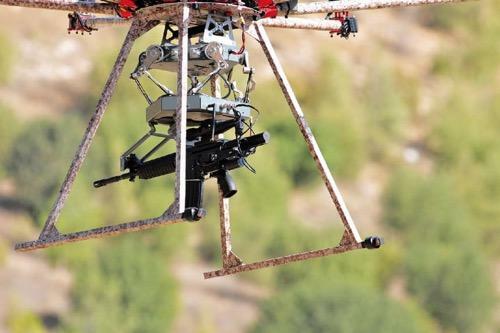 Right now, no law enforcement organization in the US can legally jam or shoot down drones. "I think we want the opportunity to have all tools in the toolbox for our law enforcement officers. To identify good from bad is a key component," Glawe said. 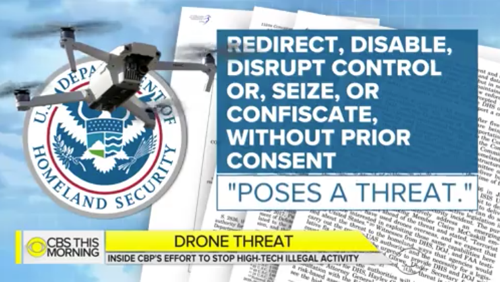 With the serious threat of an imminent drone attack, DHS asked Congress to give it the power to "redirect, disable, disrupt control of, seize, or confiscate, without prior consent" a drone that "poses a threat." DHS Secretary Kirstjen Nielsen warned in a speech this month that drones are now "a major national security concern in our homeland." "Outdated laws prevent us from setting up the sophisticated defenses we need to protect big events, federal facilities, and other potential targets from an airborne menace," Nielsen said. "DHS does not have the clear legal authority to identify, track, or take down dangerous drones. We can't even test our defensive measures in civilian environments." Earlier this summer, a Senate committee approved such legislation, but the bill has since been stalled with civil liberties groups saying there is too much room for error. Glawe says action is needed now before an attack. "This threat is upon us today. I wake up in the morning and night just hoping we don't have an attack," Glawe said. Karisch says drones they have already spotted along the border have the operational capacity to carry weapons. "There are drones now that have the ability to carry up to 300 pounds if not more of a payload. So that is a significant risk for law enforcement officers and agents in this country," Karisch warned.